Which are the best books on the Amish? Here are 27 of our favorites, in 9 categories, with comments on why each made the list. Click the jump-links below for category, or scroll down for the full list. Full Disclosure: I’ve included Amazon links to these books. If you choose to buy after clicking them, I will receive a small amount of the sale price from Amazon (the price is exactly the same for you). This book is for two groups of people: 1) those who don’t know a whole lot about the Amish, and 2) those who do know a lot about the Amish. First, this exactly where I would start if I was just starting to learn about the Amish. 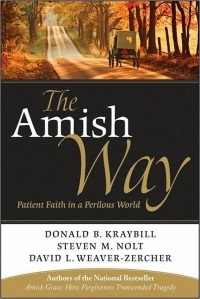 For a long time I recommended another book by Donald Kraybill, The Riddle of Amish Culture. While still a valuable read, Riddle focuses mainly on the Lancaster County settlement. The Amish covers a much greater scope, addressing the many ways of being Amish across North America in the 21st century. The Amish can differ greatly across the nearly 500 settlements, from progressive tractor-driving, electricity using New Order Amish to the highly conservative Swartzentruber Amish. In The Amish, Kraybill, Karen Johnson-Weiner, and Steven Nolt incorporate examples and data from many diverse communities across North America. If you want to learn why the Amish restrict technology or how they choose ministers or why they wear plain clothing or what roles women play in Amish society, this is the book to read. The Amish covers nearly every key aspect essential to understanding the Amish, from their beliefs, approach to technology, diversity, the power of custom and tradition, changes in occupations, gender, Rumspringa and youth issues, recent controversies, and so on. 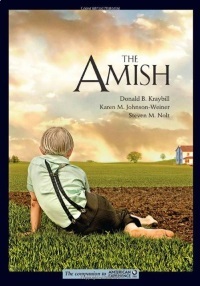 As you can see by the cover, the book was cross-promoted with the 2012 PBS film The Amish, though it really stands alone as its own book. But…what if I already know a lot about the Amish? I would still highly recommend this book. 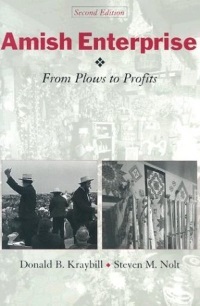 Johnson-Weiner’s unparalleled knowledge of the Swartzentruber Amish (she has had close contacts in the ultra-conservative community for over two decades) as well as the close look at Amish affiliations in chapter 8 (including charts outlining the 40+ different Amish groups) are among the many highlights of this book. You’ll leave with a deeper understanding and broader knowledge of the Amish even if the subject is not new to you. Some of the data is fascinating. To give one example – one of the many data charts in the book gives Amish family size statistics for 17 different Amish groups. It turns out family size can vary from 5.5 children in one community, all the way up to 10.2 in another! No, Amish are not all the same. “Must-read” is overused when describing books, but I think it fits here. At over 500 pages, it’s not a weekend read, but if you’re going to get just one book on the Amish, this is the one to have on the shelf or on your electronic device. 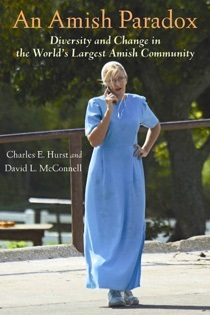 It’s the definitive general knowledge book on the Amish. Lancaster County may be the first Amish community most people think of. But somewhat less-known Holmes County, Ohio may be the most fascinating one. The reason? The nearly one-dozen different Amish affiliations found in this community of over 30,000 souls. There is no one-size-fits-all way of being Amish. While certain commonalities (eg, belief in non-resistance; restriction of technology) unite them all, Amish come in different “flavors”. 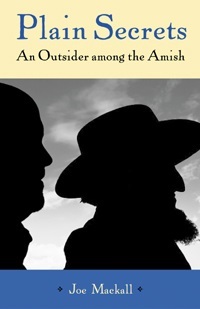 Authors Hurst and McConnell compare and contrast the many ways of being Amish within the Holmes County community, revealing the diversity within Amish society. From the mission-oriented New Order Amish to the plainest of the plain, the Swartzentruber churches, the Wooster College-based authors explore how different Amish clans differ and overlap in key areas. There is a lot of nuance in what it means to be Amish and that comes through in this book perhaps better than in any other. Major topics covered include family life, education, occupations, health care, and the origins of Amish diversity. A ton of fascinating detail about one of the largest and most interesting individual Amish communities. An Amish Paradox is one of my three favorite books on the Amish. Did you know that New York has one of the fastest-growing Amish populations? With over 16,000 Amish, the Empire State has more Amish than every other state but four. 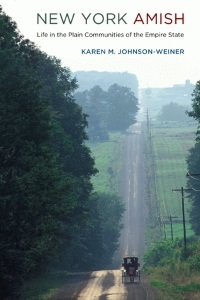 SUNY-Potsdam professor Karen Johnson-Weiner explores New York’s diverse Amish communities in this excellent work. New York Amish not only documents a thriving population in a state less known for its Amish, but also illustrates the diversity of that society as well. New York’s 40-plus communities range from the oldest and largest, the conservative Troyer Amish of Conewango Valley, to the smaller, newer settlements, populated by migrants from Pennsylvania, Ohio, and other states. We learn about western NY’s progressive Clymer Amish, originating in Geauga County, Ohio and business-oriented towards outsiders. Johnson-Weiner takes us to the Mohawk Valley region of central NY, and the five diverse communities there. We also visit the teeming settlement of highly-conservative Swartzentruber Amish along the Canada border, who’ve faced conflict with public authorities and have had to adapt their farming practices due to changing economics. Perhaps the most valuable aspect of the book comes due to Johnson-Weiner’s rare longstanding relationship with the Swartzentruber people. Thanks to these close personal ties, she’s able to give readers a rare firsthand look into the culture and back-story of this arguably most shuttered of all Amish sects. I can recommend this book not only for its excellent exploration of the Amish in New York state, but also as one of the best sources of insight into the Swartzentruber community. In Plain Diversity, Goshen College professors Steven Nolt and Thomas Meyers delve deep into the culture and communities of the Amish in Indiana. The book begins by looking at the Amish population in three contexts: 1) migration (how Amish have moved into, and within, Indiana), 2) Ordnung (the Amish rules and guidelines for living, which vary by communities throughout the state), and 3) ethnicity (there are two different ethnic groups in the Amish world – “Pennsylvania German” and Swiss; the Swiss, while being a minority among Amish, have their heaviest representation in Indiana). 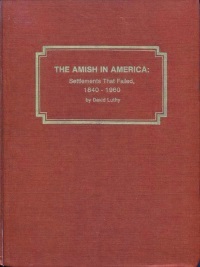 I most value the book for its later chapters, comprising an in-depth examinations of four distinct Amish populations in the state – 1) the northern Indiana settlements of Elkhart-Lagrange County and Nappanee; 2) the Swiss settlements of Eastern Indiana; 3) the two Lancaster County Amish-settled communities, and 4) the diverse Paoli-Salem area of the southern end of the state, home to four distinct Amish communities who each go about being Amish in a different way. This book offers a great level of detail in painting a rich picture of Amish in the Hoosier State. Plain Diversity goes into greater detail on the Indiana Amish but costs over twice as much. If you want a shorter read by the same two authors, get this book. Published a few years before Plain Diversity, An Amish Patchwork still goes into a good level of detail with its wide survey of the Hoosier State’s Amish locales. The authors cover both the Pennsylvania German and less common Swiss Amish ethnicities found within the state. Informative charts and maps pair well with sociological exploration of Amish practices throughout the roughly 20 settlements in the state. You’ll learn about differences across settlements in birthrate, age at marriage, church district size, occupation, and more. Amish life in Indiana is indeed a patchwork. The Amish version of Christianity comes with a wide assortment of religious practices peculiar to adherents to mainstream religions. These include the practice of home worship, and the selection of untrained, unpaid ministers from among lay people, to name just two. But Amish faith influences more than just those aspects directly tied to religion. When we wonder about the origins of this or that Amish cultural practice–the horse and buggy or plain clothing or restriction of technology, for instance–the answers often lead back to their interpretation and lived expression of Christianity. The authors deliver an accessible look at what the Amish believe, why, and in what ways their beliefs differ and/or are similar to more mainstream strains of Christianity. They investigate how closely tied Amish faith is to how they live their everyday lives. They also address certain outsider criticisms of Amish life–for instance, the controversial practice of shunning, or comparisons to more mission-oriented Christian groups, for instance. It seems a little hard to believe that it took until 2012 for a popular work solely devoted to Amish Christianity to emerge. Now that it is available, this is the first book I would recommend to the mainstream reader looking to gain an understanding of Amish faith. This book was produced by Pathway, an Amish publishing house based in Ontario also responsible for the popular plain periodical Family Life. It is a collective work and with a nod to Amish humility that’s why you don’t see an author listed here. This book covers the essential questions of Christian life from an Amish perspective, concisely explaining along the way why Amish do the things they do. 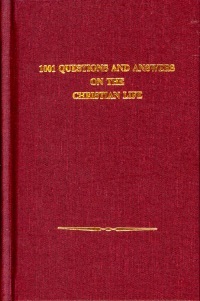 The title says “1001 Questions”, but don’t let that scare you off–it’s a readable pocket-sized tome, covering dozens of topics. – This is the Amazon link, but I don’t recommend buying it there. Amazon prices are usually among the best, but in this case you’ll find this one a lot cheaper (for about $1.50) buying direct from the Amish publisher’s distributor here (non-affiliate link). At that link you’ll also find other important Anabaptist religious texts including the Dordrecht Confession and Complete Works of Menno Simons. The Amish school shooting incident of 2006 shocked the world in two ways. First, by the sheer horror of the tragedy itself. A deranged gunman barricaded himself inside a Lancaster Amish schoolhouse and shot ten Amish schoolgirls, killing five. Second, by the surprising Amish response of public forgiveness, coming just hours after the killings. In hindsight, the Amish response was only surprising for those unfamiliar with the Amish. The Amish just did what they believe in. But many had trouble believing what they were hearing–how could a community who had suffered the unspeakable so quickly forgive? 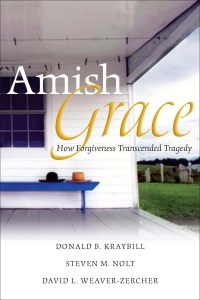 Amish Grace is a moving tale well-told by Donald Kraybill, who arrived on the scene shortly after the shooting, and his co-authors Steven Nolt and David Weaver-Zercher. This book examines the tragic events and their aftermath, from the actions of the authorities to media coverage and interpretation of the Amish response. Amish Grace then delves into the Plain sect’s beliefs on forgiveness, their origins, and practice in daily life. In creating their account and study of Amish forgiveness, the authors interview Amish people both from the Lancaster community, other communities, as well as relatives of the victims themselves. The most recent paperback edition includes a discussion and reflection guide, as well as an interview with Terri Roberts, mother of the shooter. If you don’t love history, but want one book on the story of the Amish, this is the one you should read. In A History of the Amish, historian Steven Nolt you through the centuries at a nice pace, from European Anabaptist beginnings to the Amish in America and Canada in the 20th century. Due to the amount of ground it covers, you won’t get tremendously deep levels of detail, but you will have the larger picture of Amish history down once you’ve finished. You’ll learn where the Amish come from and about persecution in European homelands by “Anabaptist hunters” who saw the adult-baptizing, non-resistant sect as a threat to established orders of both church and state. You’ll learn how they came to North America, largely in two waves in the 1700s and 1800s. In one of the more interesting chapters, Nolt explores the various movements which peeled off Amish congregants into higher churches while an Old Order identity emerged as a counterpoint to the progressive currents of the latter 1800s. As a result of progressive change, the Old Order Amish population had declined to just 5,000 at the turn of the 20th century. Amazingly, from that baseline they have grown to nearly 300,000 today. The 20th and 21st centurues have brought new trials for the Amish, as they have spread to new locations and faced issues including conflict with the state over schooling and military service. By most measures, the Amish have been wildly successful in North America, with a population that doubles roughly every 20 years, and high retention of their youth within the faith. Their rapid rate of growth has led to many new settlements being founded across North America, with Amish now found in nearly 500 locations in 30 states and Canada. But for all their success, there have been dozens of settlement attempts that ended up failing for one reason or another. Convert to the Amish David Luthy meticulously details over 100 failed Amish communities, from Bay Minette, Alabama to Pleasant Valley, Mexico. Luthy recreates the stories of these forgotten settlements using old letters, land agent handbills, cemetery records, and other documents of the past. It can be fascinating and downright surprising to learn about all the places Amish once called home–unexpected locales such as North Carolina’s Dismal Swamp or the environs of Phoenix, Arizona. The history here is obscure, but if you appreciate the stories of people and places come and gone, it can be an intriguing read. The selections from letters of the time lend a personal side to the history. We see the common concern that many Amish migrants shared – making a living, and attracting enough co-religionists to make the new settlement a viable long-term project. In many cases the settlements detailed lasted only a few short years. Some, however, lasted decades. The Amish in America: Settlements That Failed 1840-1960 makes an interesting counterpoint to the overarching story of Amish increase and migration over much of the past century. 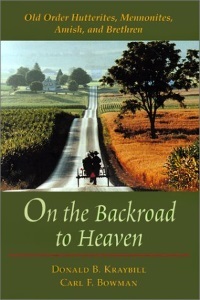 Books on history, sociology, and spirituality can give you the big picture view of the Amish. But they don’t let you experience lives in the way personal accounts do. Marlene C. Miller grew up Marlene Bailey in a little town on the edge of the Holmes County, Ohio Amish settlement. One day while ice-skating, Marlene meets Johnny Miller, an Amish boy five years her senior. She later marries Johnny, joins the Amish church at age 23, and has ten children. 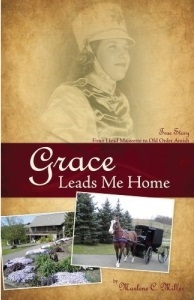 Grace Leads Me Home tells the story of Marlene’s journey from band majorette in a small Ohio town to Amish wife and mother, through early years on the farm through periods of personal struggle and overcoming. Despite the difficulties of adjusting to a new life and culture, over 45 years later, Marlene remains an active member of her Amish community. I’ve had the pleasure of visiting with Marlene and husband Johnny in the basement of their Ohio home. Marlene in real life is just how you’d expect after reading this book – warm, bubbly and full of life. As an unlikely Amish convert, she’s written a rare story of love, personal struggle, and faith. Joe Mackall is English. He lives next door to some of the most conservative of all Amish. Plain Secrets explores Joe’s relationship with his Swartzentruber Amish neighbors–Samuel and Mary Shetler–and the internal conflict he experiences over the Amish way of life. It’s a life he appreciates while at the same time wondering if its adherents aren’t missing out on things he takes for granted. Mackall explores differing, sometimes extreme, perspectives of the Amish, from those who idealize and romanticize the Amish from afar, to the ones, often neighbors to the Amish, who disparage and hate them. This is a good outsider’s firsthand look at the Amish. You shouldn’t take the depiction here to represent ALL Amish–just one of the most traditional offshoots of the group (the Swartzentruber people can even be a bit extreme, even odd, to other Amish). Some of those Swartzentruber ways are hard for Joe to swallow, in particular the limitations he sees placed on freedom when choosing to live as an Amish person. But he has a warm relationship with his neighbors, and is ultimately sympathetic to their way of living. Readers who know the Amish might recognize questions and issues they themselves have experienced when contemplating the Amish way of life. One night at 2 AM, 17-year-old Ira Wagler got up, left a note on his bed and walked out of his Iowa Amish community for the world outside. His leaving was ultimately short-lived. Ira returned to his birth culture, and departed again a number of times in the following years, oscillating between two worlds before making an ultimate break for English society. There are quite a few accounts–both on television and in print–by ex-Amish about their former lives. Ira’s account might be the best-written. At times sadly humorous (the “mad bishop of Ligonier”), at times dramatic, Ira’s story is a moving tale of struggle of a person born Amish who just wasn’t meant to be Amish. Family Life is one of the best-known Amish periodicals. Compiler Brad Igou culled the most interesting writings from 25 years of Family Life and the result is The Amish in Their Own Words. The text of this book comes from the Amish themselves, taken from articles and reader letters to Family Life. They discuss topics from marriage to family to shunning to humor to controversial issues across 16 chapters. Reading Amish publications such as Family Life is a good way to get insight into how Amish people think and what they believe. 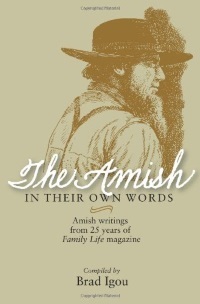 The Amish in Their Own Words gives you access to Amish thought on a wide variety of subjects, organized by the most important and interesting topics. How did Amish quilts develop from folk craft to art form exhibited in top American galleries? How did the Amish-made quilt become a coveted consumer item? What are the different styles and materials used in Amish quilts? How can they vary regionally–and also stray from stereotypes about what an “Amish quilt” should be? Quilt historian Janneken Smucker explores the story of the Amish quilt in this fascinating, richly-illustrated book, answering these and many other questions. One of my favorite bits of this book is the story of David Riehl, told in Chapter 7 (“Amish Intermediaries”). As an Amish quilt dealer who was himself Amish, Riehl was a rare individual. His craftiness and adventurous spirit led him to acquire and market quilts from his Lancaster County community to outsiders. Riehl even made regular trips to New York to do business with big city art galleries in the burgeoning years of the Amish quilt industry. Of all the books listed here, this one has the most dramatic visuals. It is available on the Kindle. But to do full justice to the vibrant quilt images, I would consider the hardbound version. Do you read Amish fiction? Ever wonder who it is writing the books you enjoy? And who else is reading them? The Amish fiction market has been growing at an accelerated rate over the past few years, and shows few signs of slowing. From a handful of novels each year in the mid-2000s, the total spiked to 85 books published in 2012. 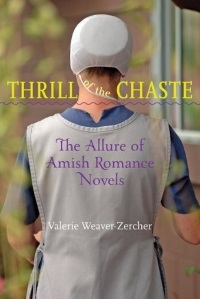 Thrill of the Chaste author Valerie Weaver-Zercher interviewed numerous writers, readers, and publishing industry insiders to tell a fascinating story of Amish fiction creators and consumers, and the industry behind the books. In addition to examining the readers, writers, and publishing side of Amish fiction, Weaver-Zercher also explores the books themselves. What themes are common in the books? How accurate are Amish novels? Does that even matter? What shape will the genre take in future? These are just a few of the questions answered in this very well-written book (Weaver-Zercher may be the most talented writer of any of the authors on this page). 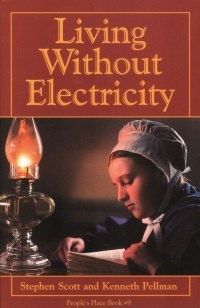 Weaver-Zercher read over 40 Amish novels while researching this book. As any good analyst would, she writes with an objective distance from her subject matter, but not without affinity for the books, authors and readers themselves. Another slim but informative tome from Stephen Scott examining an essential, and sometimes misunderstood, aspect of Amish life. What are the Biblical grounds for plain dress? How did plain clothing come to be, and how has it changed? How does plain clothing vary in different Amish communities? Readers might be surprised to learn that Amish clothing is not just one particular style frozen at some arbitrary point in the past. And that not all Amish dress the same. Scott explores the various styles of kapp, suspenders, hat and hair in helpful charts. 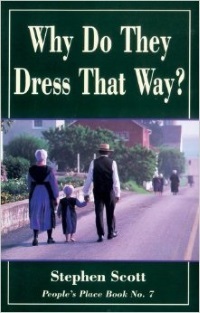 This is the only book I know of with Amish clothing as its main focus. Why Do They Dress That Way? does not limit itself to the Amish however – Scott covers other groups who dress plainly, such as Mennonites, Hasidic Jews, and Brethren. Though it’s covered in some of the books already mentioned, there really is no up-to-date book devoted solely to the Amish relationship to technology. Though a bit dated, two of the books below do explore Amish use of everyday technology, as well as that quintessential piece of transport technology, the buggy. Stephen Scott was a friend of mine who passed away suddenly in 2011. One of the things I most enjoyed was discussing obscure Amish communities, of which Steve always seemed to possess a wellspring of knowledge. Though he was not Amish himself (although sometimes confused for Amish, Steve was a convert to the similarly-dressed Old Order River Brethren), he really had his finger on the pulse of the Amish thanks to his Amish connections and careful reading of Amish publications. 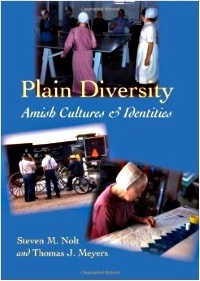 Steve enjoyed the rich variety of Amish life, which I guess must have been some of the appeal of writing a book on the Amish buggy, one place where Amish diversity manifests itself over a wide variety of buggy styles and designs. The book is the only one I am aware of that goes in depth about the Amish buggy. 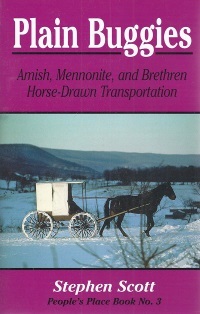 As the subtitle indicates, it also explores horse-drawn transport of groups related to the Amish, such as Old Order Mennonites. At under 100 pages, Plain Buggies is a concise and readable book. Scott describes the minutiae (the different components and materials) and variation among buggies, surveying differences across states (Pennsylvania, Ohio, Indiana) and communities. He also looks at the big picture by examining why the Amish and other sects reject the car in favor of the buggy. If you enjoy the sight of Amish buggies traveling down country roads, and want to learn more about this icon of Amish life, you’ll appreciate Plain Buggies. Why have scores of Amish shifted to running furniture workshops, construction crews, food stands, and other small businesses in recent years? How do Amish businesses handle issues like marketing, the internet, legal liability, and other areas largely foreign to the small family farm? And what has moving off the farm meant for Amish society, in the grand scheme of things? Amish Enterprise answers these and many other questions, primarily based upon research into the experience of Lancaster County Amish, a highly entrepreneurial community. Lancaster has faced more population pressure than any other Amish community, making farming a less feasible option than in other areas. Through the accounts of numerous Amish entrepreneurs the authors explore the Amish business story, and its ramifications on Amish society from social, economic, legal and religious points of view. This book was the inspiration for my own Amish business book. An aspect of Amish society which is essential to understanding the Amish today. Disclosure: I am the author of this book. At present there are only two books dedicated to Amish business. If you would like to understand the sociology and history behind the Amish move into business, get Amish Enterprise (see above). If you’re a business owner or someone curious about extracting lessons from Amish practices, get Success Made Simple. I interviewed 60 Amish business people to write this book. 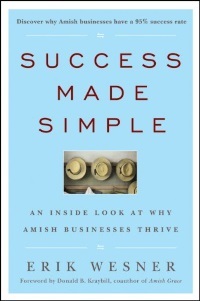 Success Made Simple has a lot of dialogue and personal stories from the Amish about their businesses, family lives, and communities, and how all those things fit together into a working whole. Researching and writing Success Made Simple was an adventure in and of itself. I tapped personal friends, Amish I had done business with, and referrals to get input from a variety of business sizes, types, and industries. Topics covered include customer relationships, sales and marketing, choosing good people for your team, and balancing business with family and the other important things in life. Amish businesses have shown high success, even exceeding a 90% 5-year survival rate. That said, you’re not going to find many blockbuster secrets revealed in this book. But you will find good common sense business lessons, along with Amish humor and wisdom–and hopefully a few new ideas that you can implement to improve your own business. This book is a bit dated, though does a good job illustrating the different ways Amish accomplish tasks we take for granted using limited and sometimes outdated forms of technology. The authors also describe the diversity within Amish society and how that affects the technological choices different groups make. For example, many Amish use gas and kerosene-powered refrigerators – though a significant minority still rely on ice refrigeration. Lighting can take various forms depending on the group, including oil lamps, pressurized gas lamps, and flashlights. The vignettes illustrating technology in the everyday lives of various Amish people which open each chapter add a nice personal touch. Charts illustrating the use of different technologies over time are a nice visual representation of how Amish adopt technologies at a different pace than the rest of us, and sometimes not at all. This is the updated version of a work first released in 2007. Why a new edition so soon? The changes brought about by smartphones, social media, and the internet–all well within the grasp of Amish youth–have brought fresh concerns to Amish parents and introduced new implications for the future of Amish society.Author Richard Stevick incorporates this new material, which he admits he (understandably) devoted little space to in the first, pre-smartphone, pre-Facebook, edition.Growing Up Amish: The Rumspringa Years also carries a slight title change from the original (“Teenage Years”). Topics covered include youth singings, dating, alcohol and drug use, weddings, youth recreation, and more.Amish make a choice to join, or not to join, the Amish church, usually by late adolescence or young adulthood. 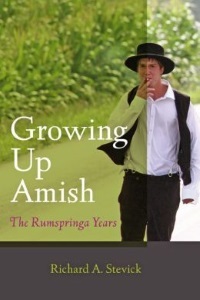 Rumspringa is the name given to the period of time when youth are old enough to socialize yet are not yet married church members.While not true of all, some young Amish people do indulge in worldly pursuits including driver’s licenses and fast cars, television and the internet, and party culture. Given this period of “freedom”, why do 80-90% of Amish youth still choose to become Amish? 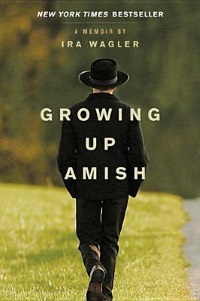 Growing Up Amish provides answers to this and many other fascinating questions surrounding Amish adolescence. 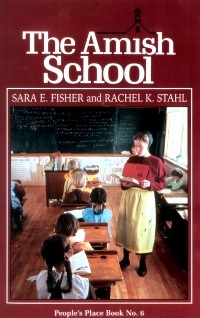 One of the two co-writers of this slim but informative tome is an Amish schoolteacher, offering a rare insider’s look into the Amish schoolhouse. Reading material and textbooks, parental involvement and teachers’ meetings, special needs children, and a typical day in an Amish school are among the topics covered. The authors give some background about how Amish schools came to be. The book also contains entries from a daily diary written by an anonymous Amish schoolgirl. A light but informative look at Amish schooling. This book dives a lot deeper than The Amish School, as Johnson-Weiner surveys the various forms schooling takes across Old Order society. Amish formal education can in fact be quite different in one area versus another–from the use of archaic 19th-century McGuffey’s Readers in the most conservative schools to art class and field trips in the most progressive. Different Amish schools, Johnson-Weiner explains, prepare their students for different ways of being Amish-such as those in more progressive settlements, whose students will likely have more contact with non-Amish people, through future occupations in business or factory work. 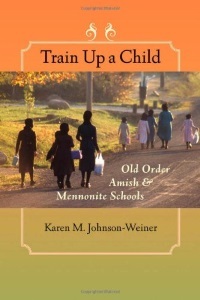 Johnson-Weiner also tells the interesting story of Old Order Mennonite and Amish collaborative schools in Lancaster County, Pennsylvania. In late 2011, eight Amishmen from a very traditional sect in Kentucky where imprisoned. Their crime? Failing to display the SMV safety triangle on their buggies and pay the resultant fines. The Amishmen’s mug shots were splashed onto pop news sites across the internet, and the men ended up spending days in prison for their violations. They were later released, and Kentucky law changed to accommodate them, following an old-fashioned letter-writing campaign by a member of the community. It was just another example in a long story of traditional Amish ways butting up against the laws of the state. This volume collects essays describing how Amish have encountered and resolved conflicts related to military service, schooling, Social Security, health care, and other essential issues. These have often required negotiation and sometimes the assistance of a sympathetic public or powerful political allies. One of the most interesting chapters describes the birth and activities of the Amish Steering Committee, the closest thing the Amish have to a unified political leadership. The Steering Committee has been instrumental in numerous issues affecting Amish up to the present day. Sometimes the Amish response to conflicts with the government or public can be perplexing or the opposite of what we might expect ourselves to do in a similar situation. 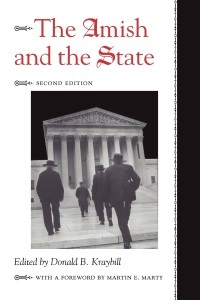 One of the essays in this collection explores how Amish follow the doctrine of “two kingdoms”, which treats the laws of man and of God differently, giving the domain of heaven preference whenever the two come into conflict. 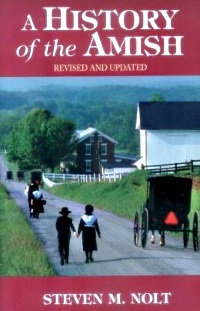 The Amish and the State sheds needed light on why and how the Amish have negotiated compromises on issues essential to their survival in man’s kingdom. In recent years the Amish have become an increasing part of media consumed by a fascinated non-Amish audience, seen in examples such as “Amish reality” television and the Amish fiction industry. But the Amish are also media creators–for example, as informants when media comes knocking to do a news report, or more directly as producers of their own publications. This collection of essays is split into two parts–the first treating the Amish as subjects of the media, the second as media makers and consumers. In Part I, topics covered include Amish in documentary films, nonfiction stories, and as objects of tourism. Part II looks at Amish-written books and publications, as well as the experience of Amish media informants, often sought after following Amish involvement in public events. Some of these essays are a bit on the obscure side, while others will be better received by a wider audience, such as the one by Steven Nolt comparing the scribe papers The Budget and Die Botschaft, or Dirk Eitzen’s look at Amish in documentary films. 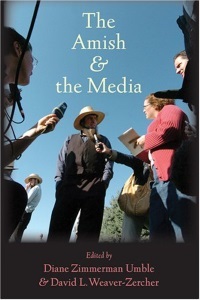 The book concludes with an essay on how Amish dealt with the media following the Nickel Mines school shooting. “Are we worthy of the high esteem the media has been piling on us?” asks an Amishman in the chapter’s epigraph, hinting at why Amish generally shy away from the glare of the cameras. What’s the difference between Amish, and their spiritual cousins like Hutterites, Brethren, and Mennonites? This is the book to get if you’d like a better grasp on how these plain groups differ–and on what they share in common. The authors examine each religious community over about 40 pages per group. Two chapters then explore what cultural and religious aspects they share, and what sets them apart. The Hutterite practice of collective goods, and much greater acceptance of technology, distinguishes them from the Amish (even while they maintain a form of plain dress and speak a form of German). Amish share a language and common transportation with Old Order Mennonites, though styles of dress differ, and men of that group lack the characteristic moustache-less beard of the Amish. The once-yearly Brethren practice of footwashing and communion recalls that of the Amish, while their greater use of English and openness to higher education differentiates them from Amish adherents to limited education and the Pennsylvania German dialect. A fascinating introduction to, and comparison of, the four major Anabaptist groups. About this list: I know quite a few of these authors personally–some are friends and acquaintances; I read and critiqued draft versions of some of these books. I’ve tried to leave that aside and give you my frank take on which I feel are best. These definitely aren’t the only good books on the Amish. However, these have been most valuable to me and are the ones I’d read first (Have other suggestions? Please let us know in the comments). Books listed in the “Others” section are either books that 1) I have not read or don’t have enough information about to recommend or 2) books worth reading after you have read the ones suggested here. This is great- a handy, comprehensive list. This ought to be required reading before anyone would be allowed to watch those faux Amish reality series on TV. 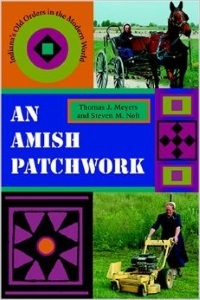 Thank you, Erik Wesner, for this website and the great selection of books on the Amish! I enjoyed taking the time to read virtually every word of your comments. As I read, I kept thinking that their lifestyle and behavior can all be summed up in “The Amish/Mennonite/Anabaptist…etc.” attempts to obey Scriptural warrant! Since I first heard of “Amish/Mennonite” when a teen, I’ve had that impression and continue to appreciate it very much! I’m particularly interested in your own book on “Businesses…” and can attest to why they thrive! I’ve had occasions to contact such businesses in my own relatively simple lifestyle in Texas. I hope to get your book, and learn if perhaps you mentioned them. 1. a friend recommended I contact an Amish harness maker for my mule team needs. The best harness I could have found! 2. When I needed help restoring a wringer washer, Leyman’s (a favorite resource) recommended an Ohio neighbor, Bunker Hill Appliance, in Millersburg. Not only did the owners help me identify the washer’s origin, and supply me with the needed parts, but clearly “went the extra mile” to teach me via phone and letter, how to install, and recommended materials to purchase locally for completing the project! Kudos to you, Sir, and to all folks who strive to live a Simple Life according to Scripture! Thank you, for the list I see a few that I don’t have. Always appreciate the work. Gladly Robert! It had been annoying me for a good while that for all the author interviews and books we have featured on this site over the years, we didn’t have anywhere to find a comprehensive list of good reading on the Amish. The list isn’t perfect but I gave it a good shot. No doubt there will be additions to the list over time. Your website is a valuable resource to anyone interested in the Amish lifestyle; however, to me…………..you are just the best! I am currently in my Capstone project to complete a Masters degree in Liberal Arts. My project is to create an online course for undergraduates entitled “Introduction to Amish Culture.” I have quite the collection of material, but have been wondering which book I could use as “required reading” in my course. Your presentation just made that decision much easier. PLUS, I found a few I had not yet known about. Thanks again! That’s a great idea Barbara! I think a course like that would provide a good service and would garner a lot of interest. Glad if this list could be of help. I’d be curious to hear how the course goes. The book that was my fave from this list was ‘On the Backroad to Heaven’. It was very reader friendly. I started to read ‘The Amish’, but it was a little too in-depth and sociological theory oriented. It would be a great book however for those who want a really comprehensive treatment. i have read several of the People’s Place books and they are excellent for people who are new to the Amish and want really good general info. Thank you Erik for this very nice list. I would also add the Concise encyclopedia from Dr Kraybill and co. I agree with you Bob – it’s actually already included in the Others section of General Knowledge. Do Amish Girls Have Rights? Thank you for a great website and list of Amish reading. So far, I have only read the titles and descriptions, not the books themselves. It doesn’t appear that any one is looking at the life of Amish girls much. The teenage girls in the very conservative sect near me in St. Claire County Missouri grow up with slim prospects to leave the Order if they want to. Their formal education is limited to something less than eighth grade. If they leave the order, their job prospects are limited to childcare, cleaning, farm chores like milking or chicken processing, cooking, rug and quilt making, sewing. Most don’t have birth certificates, ID’s of any kind, or social security numbers. If they have paying jobs, like cleaning the Methodist church near me, the money goes directly to an elder/wife who has a bank account and ss #. I would like to help a very restless 16 y.o. get her high school equivalency online, but it requires a ss # to register. She is buying risque “English” clothes at Goodwill when its just a ride to town with other trusted teen girls. I love this child. The girls and their parents trust me. Life, liberty and the pursuit of happiness is not part of the life or future of these girls. I am trying to act wisely and slowly, as a 63 yo woman should. This situation has me very conflicted. I believe that God, if he exists, gave man the gift of freewill (Story of Cain and Able). These girls are virtually prisoners, trapped in their ordnung clothes, no education, almost no prospects to survive in the world on their own. At least boys get marketable skill sets,like carpentry and construction. It’s heartbreaking that these girls have such dismal prospects. Just marriage, family and borderline poverty if not outright dirt poor. I can assure you, Patty, the Amish do have birth certificates and social security numbers and in many areas, also ID. Our Amish employees, including girls, are legally documented. See other posts on here about jobs Amish girls or single women in many communities might pursue. In many cases, a child under 21 does give their paycheck to their parents who then give a percentage to the child as an allowance and split the rest between savings account for said minor and a contribution towards living expenses. On the other hand, the parents typically provide ALL expenses for a child up to the age of 21, including personal toiletries, clothing, shoes, travel expenses, medical costs, even money to buy gifts for their boyfriend or girlfriend, or at least in the case of our employees. If the Amish in your area are NOT legally documented, it needs to be reported. I am guessing the church she is cleaning could get in a sticky situation if they are paying an undocumented worker. Maybe I’m wrong, but I’d be leery of taking the risk. Well, it’s not like that here, I know the girls, I know the parents and I know the payments made by the church secretary don’t go to the girls. This is not rumor or gossip. I know all of the girls who take turns with the weekly church cleaning. They park their buggy at my house and let their horse graze inside my yard fence. Last Christmas Day I attended the wedding supper of one of these girls in her parents’ home. I was the only English person there. The girls do get a portion of the money as an allowance. Their work prospects are very slim. They are not allowed to work in any public place (stores, restaurants, offices, factory). This Amish group does not even have many stores or shops; maybe one metal shop, small repair shops in the barn and the like. None in the group is allowed refrigeration. The children are supported until they are 20 and a half years old. I have asked the wife of the elder, with whom I have warm and close ties, if I could leave my house, small acreage and modest savings to one or more of the girls or in trust to them, since I have no heirs. After a time and discussions with her husband, I was told that it was not possible. She and her husband would be the ones that would inherit if I wanted them to have it and they would see after the estate for the girl(s). At that time,I asked specifically if the girl(s) could get SS #’s, but she said no. I am not sure why you believe what you wrote applies to all Amish, but I can assure you it does not, with great certainty. BTW, I am not going to report any of my Amish friends to anyone. What a crass thing to suggest. Please don’t make trouble. Thank you for your answer and allowing me to participate in this forum. It’s been a pleasure. We have some very conservative Amish (Swartzentrubers) in our area and they have birth certificates, SS#’s, etc. though not photo ID. I erroneously assumed that if they have such legal documents, others will as well. I was wrong and stand corrected. I have learned since posting yesterday there is an Amish group out of Kenton, OH, who do not have all the legal documents, so maybe your community has a similar group. I also learned those Amish are having difficulties with authorities over Obama-Care exemptions and tax issues. When I suggested they should be reported, it was the girls’ safety and futures I was concerned about, not getting anyone in trouble. I’m sorry I was crass, but think of what those girls are going to face should they ever decide to leave or need to reach out for outside help. There is a potential for danger for those girls if they don’t officially exist. I’m not an expert, but I am concerned. I know that standards for female employment vary and these girls evidently live in a very oppressive community. Breaks my heart — I contrast that with the ones I see every day and it really concerns me. Bless you for wanting to leave those girls a home! The degree of control I’m reading in this is disturbing, but not typical. I showed this to some of our employees and one said it sounds like a cult, and that is coming directly from an Amish girl. This group does sound like a cult.I believe most of even the Swartzentrubers around here have SS# and birth certificates.Many of Old and New Order have photo IDs and some even have passports.Typically we can get a good job around here(w/o a high school diploma) and we keep our paychecks after a certain age , usually 20 or 21.And before that we get an allowance.We all have free choice if we want to join church or get married or stay single and hold a job.I’m always sad when I hear stories like this.